A further limitation of computer-based DJing is that laptops and PCs, having descended from the Victorian typewriter, don't have the same physical controls as a vinyl-based system. In addition to the hands-on aspect of the vinyl, there are mixer faders and knobs to take into consideration. One of the first attempts to solve this problem was start-up N2IT's Final Scratch, in which special vinyl with proprietary time-code on it was played into a USB device attached to a laptop. To the DJ, it was meant to feel exactly like playing records; but the audio came from files stored on the laptop's hard drive. 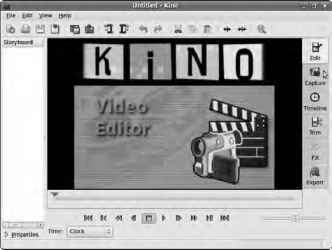 Final Scratch was originally developed on the now long-dead BeOS platform, but by the time it was released under the Stanton brand name, the laptop was running a custom version of Debian GNU/Linux. Later, this software was ported to OS X and Windows XP, with mixed results. Despite legal battles over software patents, a number of me-too products appeared, each featuring incompatible vinyl time-code and hardware. The main drawback of this type of system is that if you don't already own a pair of turntables and a mixer, proprietary time-coded vinyl or special hardware aren't much use. An alternative approach is to remove the need for traditional analogue equipment by providing a dedicated control surface: essentially, a dumb set of faders, knobs, and jog wheels (see Figure 8-2). This connects to the host computer via USB; and although it's not exactly the same experience as using vinyl, it does mean you have less equipment to carry around. These control surfaces are generally supported by one or more proprietary DJing applications for Windows or Apple platforms, often bundled with the hardware. Figure 8-2. Specialized DJ control surfaces like this Hercules RMX overcome some limitations of the PC interface. Before beat matching (perfect synchronization of two rhythms) became popular among DJs, a mixer usually had only one level control for each turntable, which could be a rotary knob or a vertical fader. It took a lot of practice to drop the level of one record while bringing up the other, maintaining the average volume so that there were no sudden quiet or loud passages. The introduction of the crossfader, usually operated horizontally, meant that the electronics could take care of the balancing act between turntable levels. As one recording fades out, the other fades in, with the main output level staying constant. 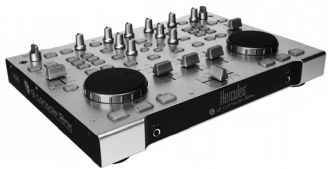 Contemporary DJ mixers also feature controls for bass, midrange, and treble frequencies, with kill switches that cut these frequencies. There may be effects on board, such as a flanger, which changes the sound of the record. Both control surfaces and DJ software have to emulate these frequency and effects features to enable the transition from analogue to digital mixing.